Posted on November 8, 2014 by Nida S.
I feel like a young kid again, tipsy and ridiculously in love. You know how everything looks less unnerving, more poetic, and most exhilarating? Yes, that feeling. That is exactly what’s going on in my over-cooked, writer brain. It’s my love for words, yet again. It’s my love for a profession I dare say is mine. All mine. Sitting with family today, I realized how everyone has an interesting story to tell. I realized how consciously aware I had become the past year or so. I wake up each day in a living, breathing story. It’s never simple and it’s never not simple. And that’s the beauty of being a writer. It’s all in front of me, I just have to look deeper. From the way a person nods his head when pretending to listen, to the way a person twitches her mouth while watching television. From a crunchy leaf silently gliding in autumn, to the rhythmic breathing of my children sleeping at night. From an ecstatic mother with worried eyes, to a callous murderer with a soft corner. The world beneath the cracks. The universe beyond the light. It’s all magic. Everything has more meaning than before. Every action tells a tale in someone else’s book, on some distant paper; a spoken word, an unspoken thought, an imagined act, a lived dream. How can you not fall in love with life all over again? I have gushing respect for people who love sharing stories and quirky anecdotes from their own lives and from others. We all know such people. A grandparent, a favourite uncle, a friend or a colleague. I could never do that. Not by speaking out anyway. So I took to written words as my LEGO blocks. I committed to a lifelong adventure. Because you know what, my words give me wings. And if you can fly, you can do anything. I will write every day of November. This is my seventh post. I know that the NO stands for NONSENSE – and personally I think it’s stupid. 500,00 people writing crap a day. How stupid is that? I hope you stop the NOsence and start to become the writer you’re capable of being. And by that you are referring to blogging or blogging challenges? Either way to it each their own. If a person is happy writing whatever it is they are writing, it’s their call. And yes as for me, this is just the beginning. My apologies for coming across too strongly. I enjoy your writing very much, and was afraid that such a challenge would do to your style what I observe seems to happen to a number of other bloggers: volume takes precedence over content and style… Apologies again. Feel free to delete it if it’s too strongly worded! Thanks, and good luck! Oh this was all in good stride:). I respect feedback of all sorts. And these issues have crossed my mind too. But for now, I will try my best to maintain quality that is expected from inkriched. When I feel I can’t cope up with this challenge, I’ll humbly surrender;). I know what you mean by the quantity over the quality dilemma and rest assured, blogging about every minute detail of my boring life is NOT on the agenda:). Thank you for reading always and for taking out the time to comment. There is always something to learn from trivial day to day things. I guess writers do that better because of the way they perceive and observe situations around them. In any case, I encourage people to write more and more. It is only going to improve them at writing, and also will make their observations better. Everything needs to be written about. Reading a broad range of stuff helps us broaden our horizons. I agree. Words can take us where our legs would not go. I enjoyed your writing style on this piece, Nida. How you described the things in front of you, made me see them. 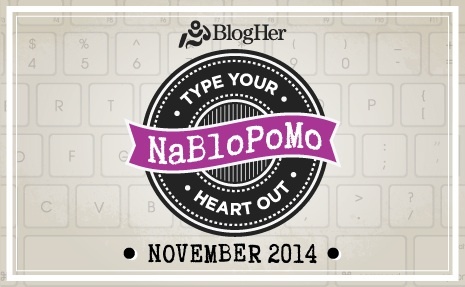 All the best for NaBloPoMo!! Truth, it comes in many forms. Words allow us to attempt to capture what is true for us. I like your words. Best of luck with your writing. This just might be my favorite post here, Nida. Your opening descriptions are just wonderful, just flew out of you like butterflies. *blush*. Come to think of it, I haven’t blushed in quite a while. And I have you to thank for that:$. Thank you always for taking out the time to comment and encourage. Words undoubtedly have given me a clearer view and have helped me to analyze things in a better manner. Writing about yourself makes you realize your strengths and weakness in a more profound manner. In my opinion, everyone should writing. This world will definitely be a much better place. And also ma’am, I started following you after I read one of your articles in tribune. Keep the good work up! “Everyone should be writing. This world will definitely be a much better place.” Oh that’s an interesting statement for research:). Thanks for commenting!